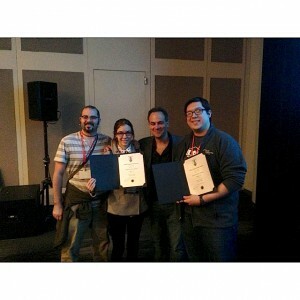 Two students from Valencia College won second place in an international sound-recording competition held this month in New York, beating out contestants from New York University, University of Miami, Ithaca College, as well as college students from Germany, Spain, Sweden, Japan, Canada and Japan. Melodie Cros and Jonathan Luna, both graduates of Valencia College’s sound and music technology program, won second place in the “Sound for Visual Media” category of the student competition at the annual convention of the Audio Engineering Society. The awards were presented on Oct. 19 in New York City. The Valencia team was all smiles at the Audio Engineering Society student competition in New York. From left, Valencia professor Joseph McBride, Valencia student Melodie Cros, competition director John Krivit and Valencia graduate Jonathan Luna. The worldwide competition is the only such student competition in the Americas. Melodie is a 2006 graduate of Millbrook High School in Raleigh, N.C. Jonathan is a 2009 graduate of Archbishop McCarthy High School near Sunrise, Fla. The two won the award for their work on “The Tailor’s Apprentice,” a feature-length film directed by University of Central Florida film student Jeff Lehman. While about half of the students in Valencia’s sound and music technology program focus on producing music, Jonathan and Melodie are more interested in post-production for film and television. For “The Tailor’s Apprentice,” an 86-minute film, the two spent more than three months polishing the sound, including bringing the actors into Valencia’s sound studio to re-record dialogue that was unintelligible. In addition, they recorded sound effects, including the many layers of sound required for a punch, plus lots of footsteps, doors closing, and other special effects sounds for the film. Because Lehman’s film, “The Tailor’s Apprentice,” has not been seen publicly, Jonathan and Melodie used only a few scenes from the film for their entry. The film’s world premiere will be held at a 2014 film festival. To satisfy film festival rules, Jonathan and Melodie could use no more than five minutes of the finished film in their entry. The Audio Engineering Society was founded in the 1920s and includes sound engineers, mixing engineers as well as those who design sound equipment. The Valencia College student chapter of AES was formed three years ago. “Just making it to the three finalists, that is a big accomplishment. Coming in second place is really good,” said Valencia professor Raul Valery, a veteran electronics engineer who spent decades working in the music, film and TV industries in Los Angeles, Orlando and Caracas, Venezuela. Jonathan is currently working for an online education company. Melodie is pursuing her bachelor’s degree in electronics, computer and sound engineering technology at Valencia.